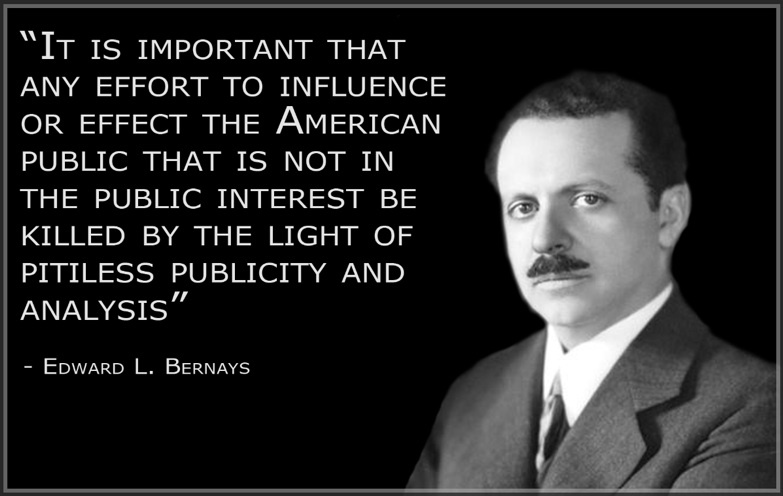 I first became interested in Bernays after seeing The Century of the Self — a documentary that I highly recommend. Bernays was Freud’s nephew and, after working as a propagandist during the first world war, he took what he had learned and developed what is now modern marketing. In 1928, after he had successfully used what he learned in the war to get women to take up smoking, he wrote the handbook for marketing (although he thought of it mostly as public relations) titled Propaganda. A recent blog post from The Last Psychiatrist caused me to track down Bernays’ book and I’m finding it quite useful. Mass production is only profitable if its rhythm can be maintained — that is, if it can continue to sell its product in steady or increasing quantity. The result is that while, under the handicraft or small-unit system of production that was typical a century ago, demand created the supply, to-day supply must actively seek to create its corresponding demand. A single factory, potentially capable of supplying a whole continent with its particular product, cannot afford to wait until the public asks for its product; it must maintain constant touch, through advertising and propaganda, with the vast public in order to assure itself the continuous demand which alone will make its costly plant profitable. The other thing that I find distasteful is his view of the public as something to be influenced and directed. This invisible, intertwining structure of groupings and associations is the mechanism by which democracy has organized its group mind and simplified its mass thinking. To deplore the existence of such a mechanism is to ask for a society such as never was and never will be. To admit that it easts, but expect that it shall not be used, is unreasonable. He makes his case quite well and one can see quite clearly that he is tries very hard to use his “power” in an ethical manner, but it still leaves you feeling a little uneasy. So, what can we get from all this? For myself, as I work on promoting the use of MediaWiki, I’m taking seriously what he says about listening to the “public” and making sure that they are not totally against what you’re producing. Many people see the popularity of Wikipedia and decide they want something similar. And, MediaWiki is available and (relatively) easy to set up. The problem comes after people run it for any amount of time. That is the bit we haven’t worked on. And that is the area that we’ve realized needs work. Figuring out what people think MediaWiki is going to do, but fails at, and then delivering that. That is the big area where we can win. And Bernays has helped me think about practical ways to do that. It isn’t a long book, but I’ll be re-reading it to write some notes for myself about how I can do things differently. Seminal book; I’m still on the first page, but I will finish this one. I finished it and didn’t end up where I thought I would with it. I’m a bit put off by the effects of all his work, but Edward Bernays makes some really good points. I should write later about what I think his good points are.